Well, I officially have more berries than your average strawberry eater knows what to do with, however, I am not your average berry eater!! The kids have been picking like mad now that the sun has been shining for several days over Eckert’s Farms so I am ready to make my first batch of Eckert’s Strawberry Freezer Jam. I will share some straight forward techniques in this post in case it is your first time making freezer jam. But let me first admit, I am not an expert canner! And in fact that is why I love freezer jam. Since we are storing the jam in the freezer (not at room temperature), there are no sterilizing/scalding steps involved, nor do you need to worry about sealing the jar. Instead, we will be using clean, freezer safe jars or containers. Truly, this recipe and technique is great for beginner cooks and hurried cooks like me. Start by selecting freezer safe jars. Many brands will note on the packaging which ones are safe for the freezer. In general, they are jars with straight sides as opposed to jars that taper at the top. Next, clean the jars in the dishwasher or with soap and water and dry completely. Labels the jars with the date and jam’s name. Then, clean and completely dry your strawberries. I like to put washed berries on a paper towel-lined rimmed baking sheet. I shake the berries gently and set them aside for 20 minutes or so to let them dry fully. Next, remove the green tops and place your berries in a flat-bottomed dish and crush with meat or potato chopper. You will need 1-2 quarts of fresh-picked berries to make 4 cups of crushed strawberries. Kitchen alert: Your house will smell amazing during this step!! Then you are all set to follow the directions below or those found on the packet of Mrs. Wages No-cook Freezer Jam. In my house, we use freezer jam as frozen custard topping, waffle topping and we like to stir it into plain yogurt. This pectin packet also works with other fruits like blackberries and peaches. Give this recipe a try next time you have some extra fruit on hand and let me know what you like serve with it! Wash jars and lids in hot soapy water; rinse well. Or clean in a dishwasher. (No need to boil water to scald any of the equipment). Mix crushed berries, sugar and the pouch of no cook fruit pectin for about 3 minutes. 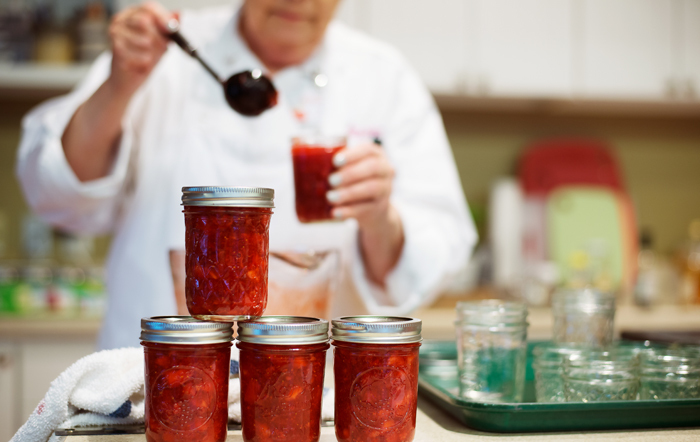 Spoon or ladle the “jam” into jars or containers, being sure to leave ½ inch of space from the top of the jar to allow for expansion during the freezing process. Use a damp cloth or paper towel to wrap off any jam that is on the jar top or the sides. Place lid flat on jar. Add ring and twist to secure lid. Let stand at room temperature 30 minutes to thicken jam. Jam can be stored in the freezer for up to one year or used from the refrigerator within 5 days.